One is wearing a bow tie, one is wearing a clerical collar. Those are as close as this array of images will get to an idea of the extreme. The photographer Fabian Bachrach took a uniform group of subjects – powerful white male Americans during the Cold War years – and represented it, component by component, in a uniform way. He was one of those artists like Vivaldi with his concertos or Morandi with his still lives of bottles who created generously within the limits of a single form. 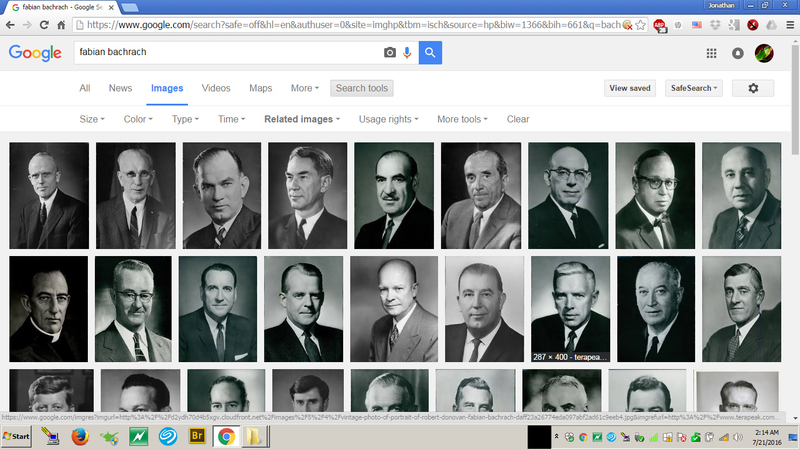 In the aftermath, Google has sorted his creations into a grid. Viewed online, framed by the bezel of a monitor, the grid loses its cell-by-cell distinctions. It becomes a single picture made up of repetitions of a single picture: a complement to Bachrach’s single mode of composition, a mosaic of just one compulsively relaid tessera. The compulsion hasn’t just shaped the grid, either; it has locked the tessera into its own tessera-form. Not even if it’s pried out of the grid can it regain its pre-grid human content. Before it entered the grid, that content depicted a man within an aura of historical reference symbolized by (for instance) a title: President Dwight D. Eisenhower; Senator John F. Kennedy; Professors Edwin O. Reischauer (of Harvard) and Arthur M. Schlesinger, Jr. (of Harvard). But the grid is a barrier against aura. To the image, it admits only indices of visual data: areas of light and shade bounded by height and width. And whatever it is that can be named within the grid won’t be named Dwight or John; it will be named wallet-size print. Forever after, it will be speakable of only in grid language. But within that language an image may still mean. It won’t mean within an aura; it will mean within the grid. 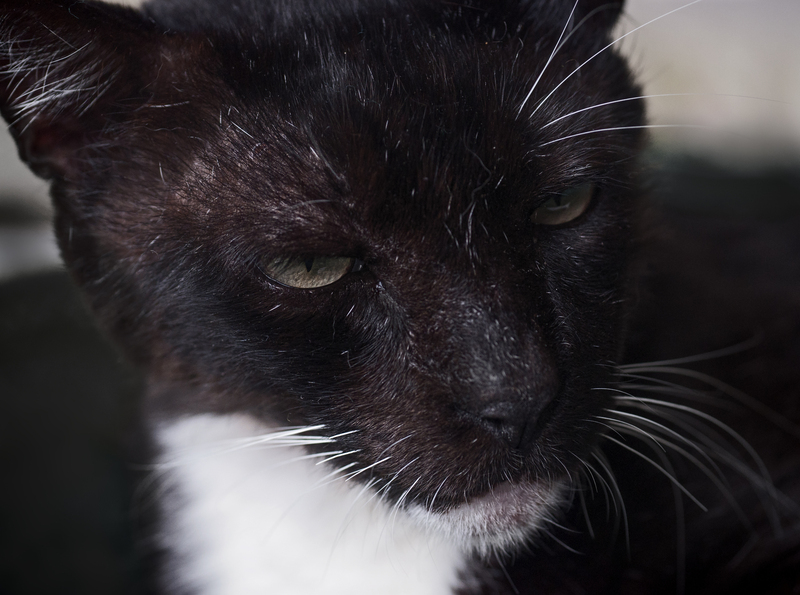 Consider, for instance, this portrait of an aged, FIV-positive feral cat. It’s large, but if it were shrunk to tessera-size, couldn’t it take its place seamlessly within the Bachrach array? And then wouldn’t the cat live on in there – live on as a someone, without a name but with a history not of what he has done outside the grid but of what he is within?